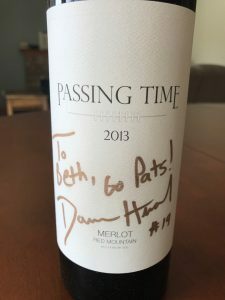 Can a winery owned by a NFL Hall of Famer and a two-time Super Bowl winner with a winemaker who cut his teeth working with Chris Upchurch of DeLille be considered under-the-radar? Just like NFL Scouts want to find undrafted or late round gems that eventually blossom into superstars, wine lovers are always on the look out for the wine gems that may be attainable now but could eventually blow up into something much more harder to find. In honor of the upcoming 2017 NFL Draft, I present to you one such potential gem–Passing Time. Dan Marino and Damon Huard were teammates on the Miami Dolphins in the late 1990s. A long time wine-lover whose family had a history of making wine at home, Marino was eager to share his passion for Washington wine with the Yakima-born Huard whose great-grandfather grew Concord grapes in Grandview, Washington. From there a friendship and eventual business partnership was kindled. 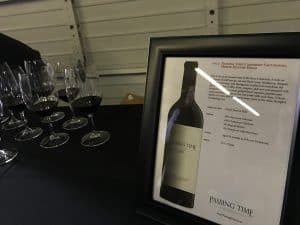 Partnering with winemaker Chris Peterson of Avennia, Passing Time was born with an inaugural release of a 2012 Cabernet Sauvignon sourced from Champoux and Discovery Vineyards in the Horse Heaven Hills and Klipsun Vineyard on Red Mountain. This past March they released their 2014 Cabernet Sauvignons featuring separate bottlings sourced from the Horse Heaven Hills, Red Mountain and Walla Walla AVAs. Barrel samples of their upcoming 2015 vintage releases were also available. Tasting the wines next to each other at the release party was not only a fascinating reflection of terroir and grape variety but it garnered a nascent sense of being on the cusp on something big emerging. In many ways, tasting this third vintage release from Passing Time and watching the crowds, I couldn’t help but think of what it was like for the folks in the early 2000s tasting Quilceda Creek before that winery exploded with a string of 100 point scores that took the price of their Cabernets north of $130. Or the folks who discovered Cayuse in Walla Walla before you had to wait 6+ years on a waiting list just to get an opportunity to buy. 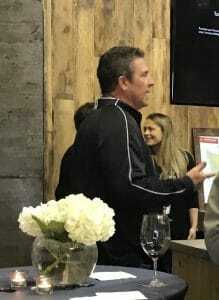 Those wineries, founded in 1978 and 1997 respectively, are rightfully in the upper echelon of Washington wines today and while I won’t say that Passing Time is at that level yet, thinking about the potential of where this winery could be around its 39th and 20th anniversary is certainly intriguing. This was far and away my favorite wine of the tasting. In fact, even counting the wonderful wines that I tasted later in the afternoon at Taste Washington from DeLille, Long Shadows, Upchurch, Andrew Will, Canvasback, Aquilini, Gorman, Betz, Col Solare, Pepper Bridge and Figgins, I would rank this 2014 Passing Time Horse Heaven Hills Cabernet Sauvignon as the single best thing that I tasted that entire day. From the moment it was poured into the glass, the high intensity aromatics of blackberry, cassis and espresso started jumping out. With a little swirling, a floral element of rose petals and fresh vanilla bean emerged. The mouthfeel was juicy and silky with medium-plus acidity holding court with medium-plus tannins that carried the dark fruit and rich, dark chocolate flavors across the palate. The finish lingered for several minutes after swallowing with a mix of subtle smoke and the dustiness you get from really good, high percentage cacao chocolate. The wine was very full-bodied but also incredibly elegant and well balanced. It’s the kind of wine that when it gets opened, it gets emptied far too quickly for something that you want to savor every drop of. Bring this to a party or share with friends at your own peril. They’ll absolutely love it but you’ll be lucky to get a glass out of it before its gone. The 2014 Passing Time Walla Walla Cabernet Sauvignon is a blend of 67% Cabernet Sauvignon from Sevens Hills Vineyard in the Rocks District of Walla Walla, 26% Cabernet from Pepper Bridge and 7% Merlot from Figgins Estate. This wine had medium-plus aromatics, lots of red fruit notes of cherry and red currants with a smokey tobacco undertone that gave it almost a St. Julien Bordeaux-like appeal. The nose was a little deceptive because the mouthfeel was much more powerful with more dark fruit and chocolaty flavors that gave more family resemblance to the Horse Heaven Hills Cab. The tobacco notes on the nose seemed to morph more towards a smoked rosemary and hickory flavor that wrapped around the fruit on the palate and had me craving some Kansas City BBQ. Very intriguing but the higher acid and more firmer tannins compared to the Horse Heaven Hills showed the wine’s youth a lot more. The Walla Walla Cab was still very good but its one that seemed like it had more layers yet to show and would benefit from some time. Note: Either the 2014 Red Mountain Cabernet Sauvignon was not available for tasting or the release party was just too crowded for me to find where it was being poured. C’est la vie. I’ll just have to wait till I crack open a bottle from my allocation. 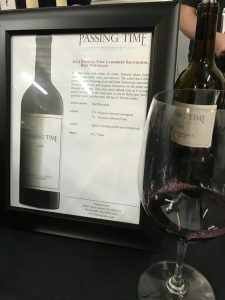 The 2015 Passing Time Horse Heaven Hills Cabernet Sauvignon barrel sample was composed of 59% Discovery Cabernet, 29% Champoux Cabernt, 4% Champoux Cabernet Franc and 8% Klipsun Merlot. Barrel samples are always hard to fairly evaluate but, like its bottled 2014 counter part, this one still captured the most of my attention. Dark fruit notes of black currant and black berries on the nose with a floral undertone. Medium plus acidity and tannins hold up its full bodied of fruit flavors that also bring some rich dark chocolate to the palate. On the finish, there is a mix of floral and spice notes that will surely emerge more with time. Nice, velvety mouthfeel for such a young wine. 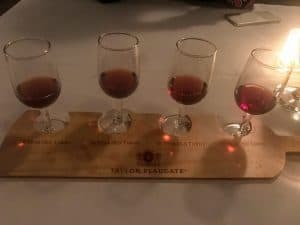 The 2015 Passing Time Red Mountain Cabernet Sauvignon barrel sample was composed of 97% Cabernet Sauvignon from Klipsun and 3% Cabernet Franc from Bacchus Vineyard. This was a beast of a wine with a brooding nose of rich, almost liqueur like, black currant with a savory herbal and spicy undertone. On the palate it is quite powerful with the rich dark fruit being more precise–still currant dominated but also with some black plum to compliment. The acid on this one seems lower, more medium, but it might just be because both the fruit and the tannins are much higher compared to the Horse Heaven sample. Just a big, big wine that will need some time. The 2015 Passing Time Walla Walla Cabernet Sauvignon barrel sample was 100% Cabernet with 64% sourced from Seven Hills and 36% from Pepper Bridge. This was the most floral and perfumed on the nose of all the barrel samples but also the most tight on the palate. The nose had some beautiful violets and blue berries aromas that had me checking the tech sheet multiple times just to make sure that there wasn’t any Cabernet Franc in the blend. The oak seemed the most present on this one as well with a lot of baking spices such as clove and nutmeg appearing on both the nose and on the palate. The acidity was medium plus with the tannins on the high side. On the palate, you could sense the core of dark fruit but it was so tightly wound that it didn’t want to give up its layers. I found this one very intriguing though and wouldn’t be shocked if the 2015 Walla Walla wine ends up being my favorite at next year’s release party. Right now Passing Time wines are available on their website for $75 dollars each with a minimum 3 bottle purchase. Some of the 2014s are making their way to select retailers mostly in the Seattle area. The key words are “right now”. While I can’t predict when these wines will sky-rocket in price or eventually become a “Mailing list only” winery with a lengthy years-long waiting list, I can certainly envision a future where that will be the case. My advice is to get some of these wines and formulate your own opinion on them while they’re still playing under their “rookie contract”. 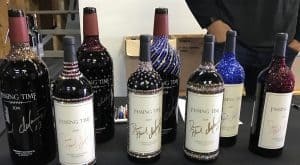 Judging from the crowds at the March 25th, 2017 release party, it’s certainly not going to be long before Passing Time moves from being savvy Washington wine-insiders’ hot pick to being one of the wines that every lover of great Cabs are going to want to grab. Tagged Cabernet Sauvignon, Chris Peterson, Damon Huard, Dan Marino, Horse Heaven Hills, Passing Time, Red Mountain, Taste Washington, Walla Walla.